New York City utilizes PayNearMe to help people pay for traffic fines with cash during non-business hours, while also relieving processing work for the city's Traffic Violations Bureau. After New York City Mayor Bill de Blasio introduced his Vision Zero initiative to reduce the number of pedestrian deaths, the NYC Department of Finance saw a significant spike in vehicle-related fines and fees. In fact, the city collected a record $1.9 billion in traffic-related fines in its first year. Fees for everything from bus lane violations (up from $12 million to $17 million) to speeding ($2 million to $31 million) to red light violations (accounting for $29 million) contributed to greater safety and New York City’s bottom line. The downside? Getting people to pay their fines. While it’s hard enough to encourage citizens to mail in a check or to pay online with a card, the process became far more daunting for the tens of thousands of people who don’t not have a bank account or that simply prefer to pay in cash– as well as the city workers tasked with processing those cash payments. Last year, more than 230,000 cash transactions were processed– a staggering number for the eight Traffic Violations Bureau (TVB) offices spread across the city’s boroughs. These offices serve customers from 8:00 a.m. to 4:00 p.m. Monday-Friday, which can be an inconvenience for cash-paying citizens forced to take care of fines during the business day– often at locations far away from their residence or workplace. The city of New York wanted to make things easier for everyone. To accomplish this, New York City utilized PayNearMe. A division of Handle Financial, PayNearMe is an electronic cash transaction network. It has partnered with numerous retailers and government agencies across the country to enable citizens to pay bills or fines in cash at local stores. In New York City, this means traffic ticket holders can pay their fines at more than 100 local 7-Eleven stores, many of which are open 24-hours, seven days a week– or if they happened to get a ticket while visiting New York, they can pay at any of 7-Eleven’s 8,000 locations nationwide. 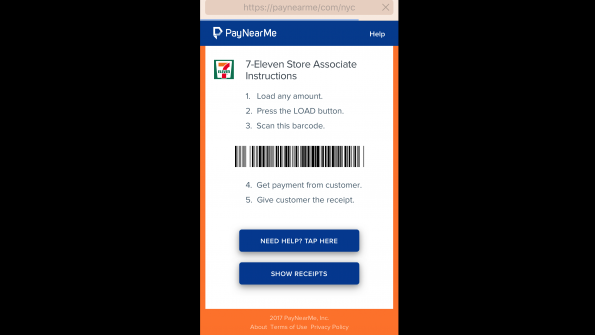 Here’s how it works: anyone with a ticket violation can go to www.nyc.gov/dofpaynearme and click the “Get Started” button to obtain a PayNearMe payment code for any unpaid balances. They take that code and their cash payment to a 7-Eleven cashier. The cashier scans the code and the payment is made. The transaction takes less than a minute to execute, and payment is posted within approximately 15 minutes to an hour. A low convenience fee of $2.99 applies. The new system is already making an impact. Currently more than 35 percent of cash payments made to the New York City Department of Finance through PayNearMe are made outside regular business hours, between 7:00 p.m. and 8:00 a.m.